This module explores patients who are at risk of Diabetes Mellitus and the identifies the type of associated foot problems they may have. 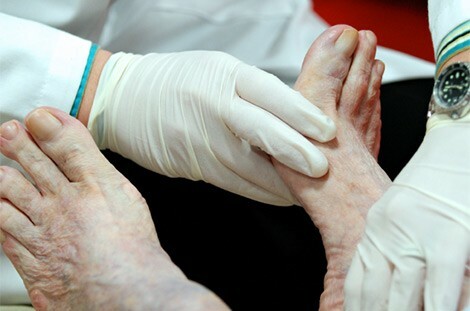 Foot problems in people with Diabetes are extremely common and can very quickly become serious, this module explores patients who are at risk of Diabetes Mellitus and the identifies the type of associated foot problems they may have. To improve your understanding of both types of diabetes mellitus. To gain a broad understanding of which patients are at higher risk of developing diabetes mellitus. To enable the health professional to recognise patients who suffer from diabetes mellitus, whether or not it has been diagnosed thus far. To provide an understanding of the process by which diabetes is diagnosed. That you might appreciate, more extensively, the serious complications of diabetes mellitus that relate to the foot. To gain knowledge concerning drugs commonly used in diabetes mellitus. To better understand how patients with diabetes mellitus can improve and maintain their health in ways that relate directly or indirectly to the disease. This 10 question module has been written by expert authors from the Society of Chiropodists and Podiatrists faculty of Podiatric Medicine and General Practice. The module is designed to test and improve your knowledge of Diabetes and the associated common foot presentations.